If you tried to insert AdSense or some other 3rd party code directly in your Blogger hosted blog, you probably saw that it’s not going to be as easy as copy-paste operation. 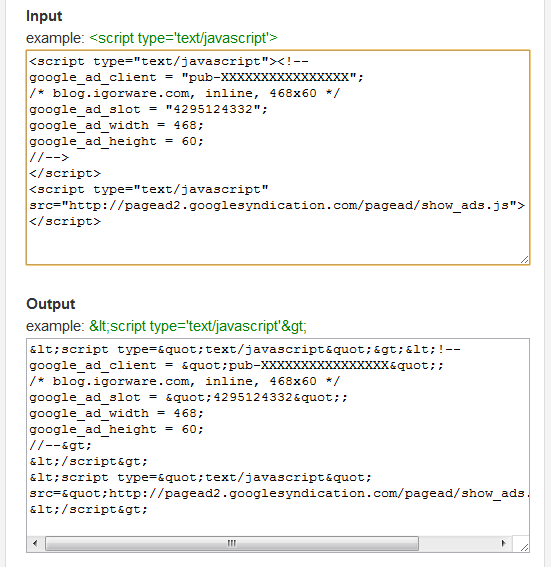 That’s way I decided to create a simple tool that will help you “prepare” AdSense code for you blog. then select new code from output text box and copy that to your blog template. Why not just use widget? That was some interesting stuff here on blog.igorware.com Thanks for posting it.